This item, approved by Wyandott Chief James Washington, provides a list of people married within the Wyandott territory in the spring of 1851. This ceramic pipe was recovered during excavations at the Quindaro townsite in 1986. It was first associated with a feature at the site that was discovered to be a late 19th to early 20th century farmstead. However, as it was recovered deeply buried in a trench the Archaeologist determined that it dated from the 1850s. The pipe has a faint mark, perhaps a maker's mark, on either side of the stem. A small amount of charcoal-like residue is at the base of the pipe bowl's interior, though there are no other signs that it had been smoked. These coins were collected from the Plowboy site in Shawnee County and donated to the Kansas Historical Society in 2017. The Plowboy site was home to the Kansa, the Potawatomi, and Euro-Americans. At various times, the site contained a farm, a trading post, and a post office with nearby military trails, Mormon routes, a railroad and the California-Oregon trail. On the top row is a shield nickel minted in 1873 and a wheat penny minted in 1916. On the bottom row are two half-dimes with a seated Liberty with stars and arrows, both minted in 1853, and a mercury dime minted in 1918. Elaborately quilted red and green appliqué quilt in Coxcomb and Currents pattern (also known as Flowering Almond). Embroidered at center in pale blue with maker's name and date: "ELIZABETH STARK 1853." 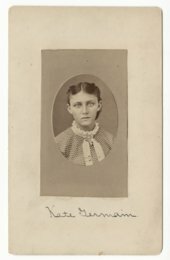 Stark was born in Ohio in 1833, married John Whitlow in 1857, and came to Kansas with her young family around 1868. Elizabeth spent the majority of her life in Topeka, living well into the 20th century. This quilt was passed down to her daughter, Lillian Whitlow Johnson. Hand-wrought communal iron drinking cup with attached chain. The cup was attached to a rock by the Sulphur Spring public spring near Fort Scott around 1800 and saw continuous use until communal drinking cups were banned by the Kansas State Board of Health in 1909. The cup was replaced by a sanitary drinking fountain on November 1, 1911. Dr. Samuel J. Crumbine, Director of the Board of Health, used the cup in his public health and sanitation campaigns, and it was later displayed at the Paper Cup and Container Institute in New York. These deeds from the James Stanely Emery collection document a real estate purchase from James S. Emery for $500. Nathaniel S. Higgins of Fair Haven, Massachusetts is purchasing half of an undivided lot (Number 30) and the stone or concrete building currently occupied by Emery on Massachusetts Street in Lawrence. If Emery is able to acquire share number 97 of the town of Lawrence from the government, however, the sale will not take effect. James Stanley Emery was born in Franklin County, Maine in 1826. Educated at Waterville College, he was admitted to the bar in New York in 1854. He was involved with the New England Emigrant Aid Company, coming to Kansas with the second party of immigrants, and generally in free state activities in Kansas to ensure that it became an anti-slavery state when it entered the Union. Through the following years, he worked in numerous states for the cause. Emery was a member of the Leavenworth constitutional convention and served on the Kansas Legislature in 1862 and 1863. He was a lawyer and worked as a journalist for the New York Daily Times. President Abraham Lincoln appointed Emery U.S. District Attorney for Kansas in 1864. In 1891 he was president of the Kansas State Historical Society. Emery died in Lawrence in 1899. Shown are six gunflints of the many that were found at the Canville Trading Post in Neosho County near the Osage Reservation. They were donated to the Kansas Historical Society in 1994. Gunflints were used to generate a spark in a flintlock musket or pistol and as strike-a-lights for lighting a fire. These six gunflints were all quarried and manufactured in France, as is indicated by their honey-yellow or blonde color. Left to right they show two square gunflint with two dorsal arrises, two somewhat "D" shaped gunflints, and two small square gunflints, possibly used with a pistol or as strike-a-lights. This photograph, a copy from a daguerreotype, shows George Washington Martin, 1841-1914. In 1857 Martin migrated to the Kansas Territory from Pennsylvania settling in Lecompton, Kansas where he worked with the pro-slavery paper the Lecompton Union, later becoming the National Democrat. Martin later established himself as a newspaper editor and publisher founding the Junction City Union. Actively involved in the community, Martin held several public offices from mayor of Junction City to serving in the Kansas House of Representatives. In 1888 he moved to Kansas City, Kansas, establishing the Daily Gazette newspaper. Martin was the managing editor of the newspaper until 1899 when he is elected secretary of the Kansas Historical Society (KSHS). Martin held this position for fifteen years and was appointed secretary emeritus of KSHS in February 1914. He passed away on March 27, 1914 in Topeka, Kansas. Shown are six gunflints of the many that were found at the Canville Trading Post in Neosho County near the Osage Reservation. They were donated to the Kansas Historical Society in 1994. Gunflints were used to generate a spark in a flintlock musket or pistol and as strike-a-lights for lighting a fire. These six gunflints were made from local cherts. Left to right they show three square gunflint each with a single dorsal arris, a square gunflints with two dorsal arrises, and two small square gunflints, possibly used with a pistol or as strike-a-lights. This doll, donated to the Kansas Historical Society in 1920, has a muslin body, real hair braided into two braids, beads for eyes, and a face sculpted by stitching. The doll's dress is made of blue strouding, a course cloth often used in trade, and her leggings are of red wool. The belt and mocassins are of leather. All of the doll's clothing is decorated with various colored "seed" beads. The doll has a necklace, two bracelets, and one earring made of the seed beads. One earring is now missing. This a photograph showing Henry B. Douglass who was born March 9, 1827 at West Point, where his father David Bates Douglass was Professor of Engineering. Henry Douglass graduated from West Point in 1852, and was promoted to Bvt. Second Lt. and assigned to the 7th Infantry. He was stationed at Fort Dodge, Kansas. Several different styles of shoes were recovered from Fort Atkinson in Ford County and donated to the Kansas Historical Society in 2015. Shown here are two smaller mule shoes ("U"-shaped), a veterinary shoe (nearly a complete circle), two horse shoes (for different sized horses), and an ox shoe. Fort Atkinson, occupied for only four years, was located along the Santa Fe Trail. This portion of an ironstone plate was recovered from the Quindaro town site and reconstructed by archeologists. The oriental flowblue pattern dish was manufactured by Podmore, Walker and Co of Tunstall, England. Cased sixth plate ambrotype portrait of J. B. Remington. This is a reminiscence by abolitionist John Armstrong, detailing his time in Kansas and his involvement with the Bleeding Kansas movement. It is reported that Armstrong was greatly involved in the Underground Railroad in Kansas. This photograph represents the Kickapoo Corral at the Arkansas River in Winfield, Cowley County, Kansas. The photo was taken by H.E. Shilliman (1847-1909) in Winfield, Kansas. In the bottom right corner in pencil the number 102 is written. This is a collection of records spanning the years of the Little Stranger Christian Church (1853-1914) and the Little Stranger Christian Church Society (1969-2005).